Essie Uptown Taupe, 3 coats with Seche Vite. A blushing taupe with a gorgeous silver shimmer throughout. I love this color, but I don't think I like it on me. This indoors picture is showing more pink than in person, which is just slightly darker (more brown?). I like showing both hands with konadicures, interesting to see how each hand turns out, no? I used plates m20 and 25. Click to enlarge if you like! 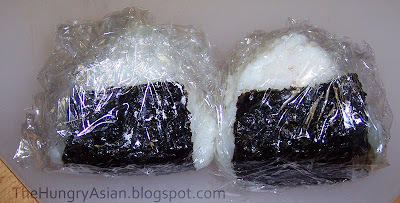 Last week I felt like I would die, just DIE if I didn't eat any onigiri. It's just a ball of rice that has a little something inside like pickled plums or fish wrapped in seaweed. I went to Safeway and they sold the full size sheets of seaweed so I made some! I made waaaay too many so I wrapped them up, forgot to take pictures until I ate half of them lol. Looks like that China Glaze ended up being awesome for Konad stamping! I'll have to pick up a few from that collection. That's a gorgeous Konadicure! I love using ChG for stamping, I've found they work great and don't smear with top coat! That looks so pretty, that is a great konad design! I love you art. It's super cute. I think "Uptown Taupe" looks very pretty on you. I just picked it up today because I couldn't find "Over the Knee". I'm glad I got it after seeing your post & I got it for only $4. How lovely your nails look. I love the design you used. Sorry you had to finally cut your nail. I love that taupe color...very pretty and the stamping adds just the right touch. Lovely nails! awaken does really seem to work great with Konad it almost seems to look like the new princess special polishes Konad released a while back, doesn't it? Hi Kae! Oh...now I'm hungry...lol! I do like the taupe color on you,and of course the konading makes it look perfect. Ooh you too huh? Yeah I put lots of ume in mine! I love sour stuff. Yeah it was great with konad, i need to pick some more up myself! Thank you, I never tried anything but their OMG polishes to stamp with (and thats always great).